For the past couple of years, I can safely say that I've spent much more time shopping on Instagram than I have at the mall. With so many stylish people, brands, and retailers to inspire me at my fingertips, why would I leave the house to buy anything to wear? 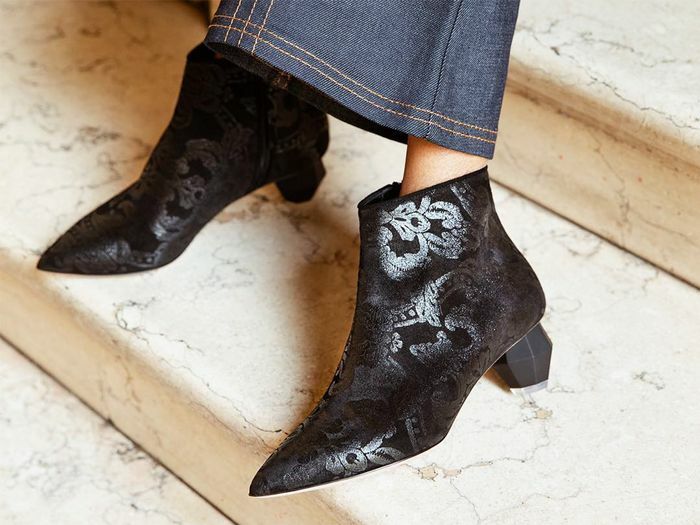 Recently, I divulged 15 of my favorite Instagram accounts to scroll through when I want to buy something, and now, I'm putting the spotlight on shoes. I'm admittedly a shoe fiend and would rather buy footwear than just about anything else (which is saying a lot). For that reason, I have many accounts I follow when I just want a new pair of shoes. Some are brands, some are ridiculously stylish women, and some are online retailers with amazing shoe selections. Whatever the source, I know that following these accounts will keep me in the know about the latest and greatest styles. Care to join me? Keep scrolling to find out which Instagram accounts serve up constant shoe envy for me, and shop shoes inspired by each. @j2martinez asked me where I got these 🧦 socks so that he could recreate the look himself. THE POWER PAIR: Put your best foot forward in @therow's barely-there sandals. Minimal and sophisticated, you'll want them in every color. #DressFromTheFeetUp Tap the link in bio to shop your favorite looks from Instagram at #NETAPORTER. Gucci - marmont leather thong sandal • Message or email me to purchase. Email on profile. Next up, the polarizing shoe trend that will be everywhere this spring.